The Scubster is a compact, pedal-powered submersible which was developed by a group of designers and engineers led by Frenchman Stéphane Rousson. 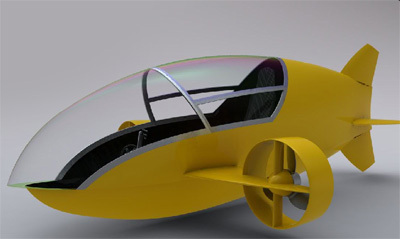 The sub was designed by Minh-Lôc Truong, and a team of University engineers and students helped to make the concept a reality. 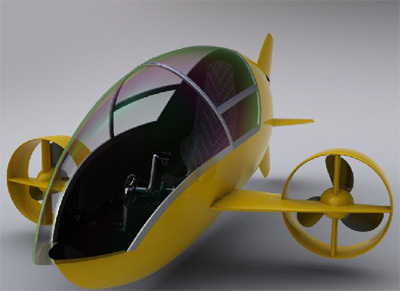 The little sub is a strict one-seater, and the pilot must also supply all the energy to power the Scubster. Seated in a manner similar to that of a recumbent bicycle, the pilot has to pedal like a madman to spin the two propellors - one mounted on each small wing sticking out of the side of the craft. The pedal mechanism is a custom setup - because you can't really pop into your local bike shop and ask for some pedals, gears and chain for your submarine. Instead of a chain the drive is via a rubber belt borrowed from a Strida folding bike. The Scubster is a wet sub, that means the occupants are going to get wet because it isn't an airtight sealed unit. The pilot relies on scuba gear to breathe. A lot of people will be thinking; "why bother with a sub - surely it would be easier to just scuba dive?" Well in many situations that's probably true. However the subs designers have not created the vehicle for the casual sport diver. Instead the Scubster is meant to assist in research and exploration, also the increased carrying capacity means that the pilot can carry significantly more air than a scuba diver can. Also the fact it can operate on the surface means that divers can get themselves out to a dive location (within reasonable distance) without the need for a support vessel. The teams aims to be able to hit a top speed of 10km/h (6.2 mph, 5.4 knots), have a high degree of maneuverability, and also be able to navigate the sub on the surface. At the moment they're in the testing and developing phase. 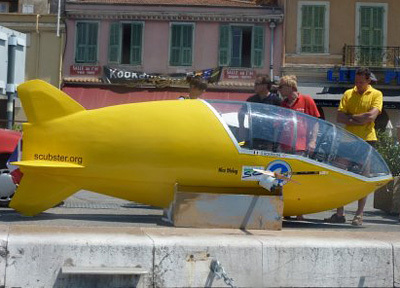 The Scubster's creators hope to be the first French team to enter the next 'International Submarine Race' which will take place in June 2011. The race will be held at the Naval Surface Warfare Center-Carderock Division, Bethesda, Maryland, USA.